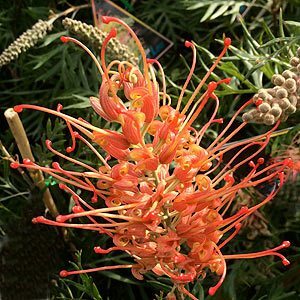 A new release, Grevillea x ‘Loopy Lou’ is one of the more interesting cultivars in that it is low growing, to around 60cm. This however does not mean the flowers are small. For a small shrub Loopy Lou also has a fast growth rate. In good conditions, this is a very long flowering Grevillea, it can provide good colour almost year round. It performs best in full sun, however a little shade will be OK, as long as its not deep shade. The flowers change through from yellow to red as they age, and like many Grevilleas will flower year round. The warmer the climate the longer it will flower. The low growing nature malesLoopy-Lou an excellent for smaller gardens and for planting as a screen for a fence. The flowers attract birds and insects to the garden, the foliage acts as a refuge and attracts small birds to the garden. Plant near a bird bath, sit back and watch the birds. Choose a sunny position with a well drained soil. Most soils will not require any amendment, in very poor soils dig in some well rotted compost. Water through the first summer during long dry spells. Fertilise in spring with low phosphate native plant fertiliser. Grevillea x Loopy-Lou is at its best when lightly prunes twice a year, this creates a more bushy habit. Height – will reach around .6 m in height. Width – Will spread to around 1m to 1.5.